Because Aelred’s treatise responds to Cicero’s treatise on friendship, I’m at a disadvantage, at least until I read the Cicero. I do understand that Aelred swapped out Cicero’s classical examples for examples from the Biblical histories. And though in all other respects animals are rated irrational, yet they imitate man in this regard to such an extent that we almost believe they act with reason. Aelred had just offered the whole of creation as a mirror to teach friendship; yet here, with animals, he switches to having animals imitate humans; he refuses to let (nonhuman) animals instruct humans and insists on human primacy. For the rest of the work, he calls people without friends worse than beasts (e.g., “a man is to be compared to a beast if he ha no one to rejoice with him in adversity” (71, also 82, 83, where affection without reason is “an animal movement”). • As it’s a moral/practical dialogue, Aelred includes some ‘dramatic realism’–lookout! here comes the cellerer! can it, bros! (105) Walter and Gratian, hilariously, can’t stop fighting for Aelred’s attention–but there’s otherwise little reference to the practicalities of monastic life. For example, advice–presumably ported wholesale from Cicero–about worldly goods, bribery, and friendship has been included when monks, particularly Cistercian monks of the twelfth century, would not have had personal property to distribute. So far as I know, then, some of Aelred’s advice is otiose for its compositional context (e.g., 118). Does he expect circulation outside monasteries? • More to the point, there’s also no engagement with previous monastic warnings against factionalism, friendship, nor is there any sense–although there should have been!–that a friend is a kind of private property, particularly within the community of the monastery. Throughout the dialogue, in fact, Aelred and his several companions express their wish to be alone with each other, to exclude others, meaning other monks,from their conversation and thus from Aelred’s lessons. We therefore have the sense, throughout, of eavesdropping where we’re not wanted. Aelred also implicitly shows the dangers of friendship through the squabbling of Gratian and Walter. Notably, Aelred treats these exclusions not morally but practically. His concern in what amounts, for large sections, to a how-to manual, is to provide a guide for admitting another into one’s confidence while minimizing the chance of betrayal. Indeed, the person who merits inclusion in the inner circle of friendship is, as in Cicero, an alter ego, but it is–contra Cicero–an alter ego guided by God, by service to the state, by adherence to the laws (102, and especially 105), and thus wholly bounded within various predictable legal structures. In presenting friendship this way, Aelred aims to minimize the engagement with the ‘wholly other,’ and therefore with vulnerability, surprise, hospitality (in the openness treated by Derrida in [Book:Acts of Religion]), and to advance rational guidance above all other concerns (130). Friendship may be an end in itself, it may be a guided by both affection and (mainly) reason, it may be just this side of the relation with God (e.g., 73 and especially 131-32), but for Aelred, it’s finally a cautious thing. In short, it provides almost nothing for thinking an ethics of friendship, let alone an erotics of friendship (the preference here is for Proverbs over the Song of Songs). • Social historians and particularly historians of gesture will be interested in Aelred’s classification of kinds of “carnal” kisses at 76: in such kisses he includes those used in rituals of reconciliation, church rituals, and also that “permitted between bride and groom.” They might also note Aelred distaste for subservience, although he carefully explains that this includes only freely born people (121). 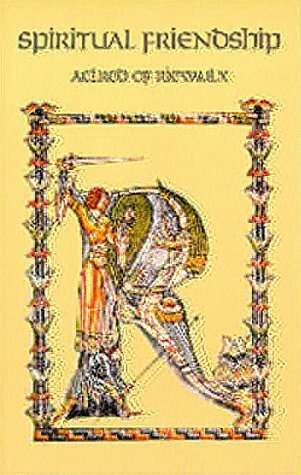 • I do like Aelred’s thought experiment to prove the human need for friendship: imagine, he says, “that the whole human race has been taken out of the world leaving you as sole survivor” (110). You have all the wealth, have complete Edenic mastery over animals, but are you happy? Wouldn’t you be happier with another person, even if you didn’t speak his language? Douglass Roby’s introduction, incidentally, could just as well have been written in 1874 as 1974. It’s appalling; e.g, it speaks of twelfth-century Scotland as a “still very barbarous land” and of the Scottish court’s interest in “bringing the customs and advantages of Norman civilization to the North” (5); it speaks about the customs of the “sons of good famil[ies:],” the “soften[ing:]” of the “somewhat rough sounding Anglo-Saxon name of Ethelred” to “Aelred.” Throughout, its prejudices are Catholic, English–which is to say anti-Celtic, royalist, and the attitude towards textual evidence is naive, earnest, and superficial. This entry was posted in Book Reviews, MedievalBlog by medievalkarl. Bookmark the permalink.